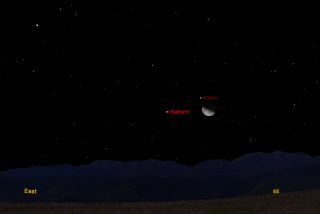 This sky map shows the so-called Saturn Triangle between the moon, Spica and Saturn on Jan. 16, 2012 as it will appear to skywatchers in mid-northern locations at about 2 a.m. local time. Skywatchers who are out and about after 1 a.m. local time Monday (Jan. 16) will have an interesting celestial array to admire, composed of the moon, a bright planet and a bright star. The configuration initially will resemble a rather crooked triangle low in the east-southeast sky. Along with the moon — which will be at last quarter or "half" phase — will be the planet Saturn, shining sedately with a yellowish-white glow well to the left of the moon, while hovering much closer above and to the left of the moon will be the bright bluish star Spica, in the zodiacal constellation of Virgo. The moon, of course, appears to pass Spica every month, but over the past year or so Saturn has also happened to be nearby, so we have been christening these monthly gatherings with the moniker " the Saturn Triangle." The sky map of the Saturn Triangle associated with this story shows how the celestial trio will appear at 2 a.m. local time to observers at mid-northern latitudes. Saturn is currently 902-million miles (1.45-billion kilometers) from Earth and will not change its position relative to the background stars during the course of a single night. But the moon is only 228,000 miles (367,000 km) away and, as a result, will slowly shift its position to the east during the course of the night. In fact, the moon appears to move east against the background stars at roughly its own apparent width (0.5 degrees) per hour. If you hold your clenched fist out at arm's length, it will measure roughly 10 degrees. So, less than six hours after the triangle's first appearance, the moon will have appeared to move about 3 degrees farther away from Spica, causing the figure's base to appear to become wider and transforming it into a rather convincing isosceles triangle (a triangle with at least two equal sides). What makes this triangle an isosceles is that Saturn will be located at an equal distance from both the moon and Spica: 7 degrees. So the Saturn-moon and Saturn-Spica sides of the triangle each will be slightly less than a fist's width in length (10 degrees). The side of the triangle from the moon to Spica will measure just 4 degrees. Saturn, at magnitude +0.6, is roughly a half-magnitude brighter than Spica. If you have a small telescope, check out Saturn's rings. Back in the late summer of 2009, Saturn's rings were all but invisible to Earth viewers because they were turned edge-on (or nearly so) from our perspective. Now, however, the rings are tilted about 15 degrees toward us and are readily seen if you are using a telescope with magnification of at least 30-power.